We are engaged in processing, supplying and exporting a wide range of Coriander Leaf Powder. It is a ingredients of chutney, and spices industry. 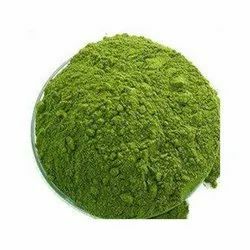 We are enlisted amongst the leading names in the industry offering our clients Dehydrated Coriander Leaves Powder. Grounded from coriander seeds, coriander powder is an essential condiment in the Indian cuisine. Very few dishes can be made without the touch of coriander powder. It has a pleasing aroma and savour. Coriander from which the powder is made is one of the world's oldest spices. Leveraging on our extensive experience, we offer Coriander Leaves. These leaves are used in varied kinds of cuisines such as South Indian, Chinese, Non-vegetarian and Gujarati. Clients are assured of timely delivery of fresh leaves at their doorsteps. We strive to offer international quality products to our customers. 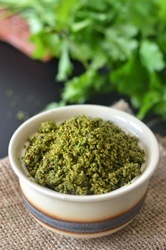 This Coriander Leaf Powder is prepared from dried fresh coriander leaves. Fresh coriander is procured from our trusted vendors.Rich in vitamins and calcium, these Dehydrated Coriander Leaves have various medicinal benefits and considered as an essential part of curry powder.